The Keil MCB2300 Evaluation Boards allow you to generate and test application programs for the NXP LPC23xx device family. With this hands-on process, you can determine the hardware and software requirements for current and future product development. This board is available in four variants: the MCB2360, the MCB2370, the MCB2387 and the MCB2388. The MCB2360 is populated with the NXP LPC2368 microcontroller. 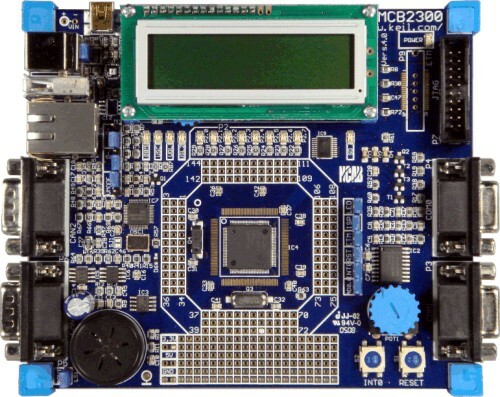 The MCB2370 is populated with the NXP LPC2378 microcontroller. 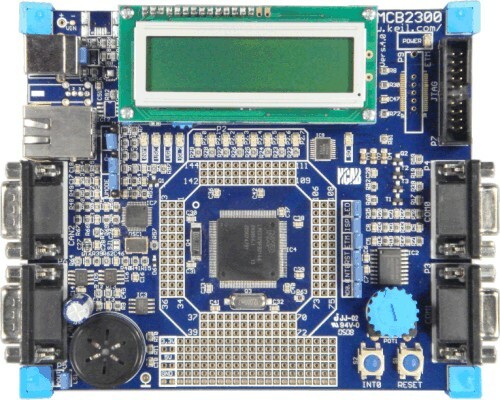 The MCB2387 is populated with the NXP LPC2387 microcontroller. 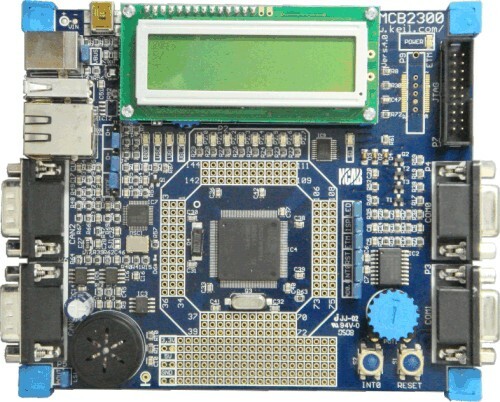 The MCB2388 is populated with the NXP LPC2388 microcontroller. The supplied microcontroller is the only difference between the MCB2360 and the MCB2370 boards. The MCB2387 and MCB2388 boards contain additional connectors for USB-OTG support. 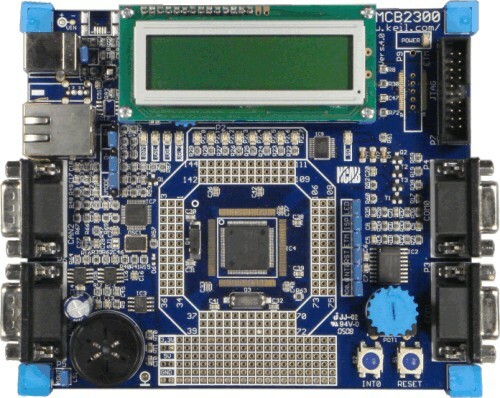 The MCB2370 board uses the NXP LPC2378 microcontroller which has a larger package size and pin count than the NXP LPC2368 or LPC2387. The MCB2387 and MCB2388 boards add USB "A" and mini-USB connectors for USB-OTG support. Revision B LPC2387 devices with a date code of xxx0836xx or higher support USB-OTG. MCB2387 boards built with the these LPC2387 devices are populated with the USB "A" and mini-USB connectors. MCB2387 boards built with older LPC2387 devices will not have the USB "A" and mini-USB connectors installed. Except as noted, this manual uses MCB2300 as a generic term to refer to the MCB2360, MCB2370, MCB2387 or MCB2388 board.